Cover Title: "Deathstorm: T-Minus 1!" On a far distant planet, two members of the Nova Corps have been brutally attacked. The Centurion tells his fellow corpsman, Torthar, that he will not abandon him. The attacker tells the Centurion that he will be following his friend in death. The murderer turns to the sky and swears that Kraa will not stop until he destroys Xandar and the entire Nova Corps! Back at the Rider's house, Nova apologizes to his parents for the abduction of his brother, Robert. Robert had been working on a way to stop the threat of Deathstorm. While calculating his figures, Aakon agents broke into and kidnapped Nova's brother. As the police arrive, Nova's helmet picks up a police emergency dispatch. The Human Rocket arrives at the city dump to find his ally, Nova 0:0, sprawled out on the ground! Nova 0:0 explains that he had arrived at the Rider home and battled the Aakon. After knocking the Aakon warriors through the window, Nova 0:0 took Robert to a subway station and left to confront the aliens. Nova 0:0 tells his friend that the Aakon had blasted him with an energy weapon which has weakened him and left him in pain. Nova's ally makes the young hero promise to protect his family and planet no matter what happens. The Human Rocket gives him his word. When Nova looks down at Nova 0:0, he finds that his ally has disappeared. When Nova turns around, he finds his fellow New Warriors' teammate, Kymaera, waiting to talk to him. Nova begins to suspect something is wrong when he notices his friend's skin has changed from blue back to its original pink color. Before he can react, Kymaera sprays a powerful knockout gas at Nova! With Nova unconscious, the Kymaera imposter reveals her true form to be that of a Nova Corps' member! The Corpsman is a Skrull shape-shifter named Grot. The Skrull and another Corpsman take Nova and return to Xandar via a local Star Gate. During the journey, Xandar's leader Queen Adora telepathically informs Nova of Kraa and his threat to Xandar and Earth. Meanwhile on Earth at SHIELD Headquarters, one of the leaders of the Shadow Consortium, Maxov, reflects on how he has betrayed the human race to the Aakon. He realizes that the Aakon's plans can't be stopped even by Nova. At the same time, on the space station known as Ram's Head, the Aakon are eliminating any member of the Shadow Consortium they feel is not loyal to their cause. As they watch their soldiers being killed, the Planner and Thera are debating whether to fight or side with the aliens. The Planner wants to survive and sides with the Aakon while Thera realizes that Nova is needed to save the Earth from the alien warriors. Back in space, the Nova Corpsmen and Nova arrive at a Xandarian spacecraft. They are surprised to find that the ship has been seriously damaged in battle! On board the spacecraft, the Novas find another of the Nova Corps barely alive. The Centurion, Tas'Wzta, informs them that the other Centurions are either dead or on the planet below waiting to battle Kraa. Tas'Wzta's fellow Novas tell him that they have brought Nova-Prime with them to battle Kraa. 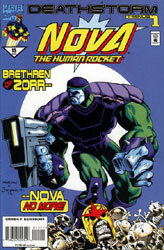 Nova protests his kidnapping and demands to be returned to Earth so he can protect it from Deathstorm. The Corpsmen refuse and declare they will battle to the death to prevent Nova from leaving! Before a full-scale battle can erupt, Tas'Wzta asks Nova not to fight and to help them save countless worlds from Kraa's destruction. After considering the Centurion's words, Nova agrees to help. Just then, Kraa's ship savagely attacks the Xandarian starship! As their ship continues to be blasted apart, Nova grabs the weapon systems' power core. The young hero takes the core and connects it to the ship's main weapon. Mounting the weapon on his shoulder, Nova uses his gravimetric pulse to blast a hole in the hull of the ship. As Kraa's ship turns to make its final attack, Nova fires the Xandarian's Photon-Beam Gun! Kraa's ship is fatally damaged and spins out of orbit towards the planet. However, the Xandarian spacecraft is also destroyed with Nova and Grot being the only survivors. Nova watches the alien ship's descent and realizes he must pursue and stop Kraa. Down on the planet's surface, Kraa staggers from his ship's wreckage and swears to destroy Nova!